Cooking touches a child’s senses, enabling them to remember what they’ve learned in a way unlike any other. They (mostly) follow instructions, use maths skills and it offers a valuable, often messy family activity for you to spend time together 1-1. I try and encourage my son to feel the kitchen is his domain as much as it is mine. It also builds self-esteem and children feel responsible, because you are trusting them with an important family task. I find the sense of accomplishment and involvement means my son is more likely to eat the food he makes, even carrots in a roast dinner! I am all about simplistic, tasty deserts that which I can use to trick my son into eating something vaguely healthy. Our Gluten free salted caramel brownie split stack ticks so many boxes off our yum list. Sounds like a bit of a mouthful doesn’t it, a very tasty mouthful! First, whip up the ‘wet’ salted caramel, this does take care so I found it easier to do without help from little hands (molten sugar is seriously hot!) OR if you are short on time, grab some from the shop. Simple. 1 cup white caster sugar (it melts more quickly and easily). 2 teaspoons of sea salt. 3 large tablespoons of soft unsalted butter. Have all your ingredients measured and ready to go! Put the sugar into large, deep, heavy saucepan and add the water. Gently dissolve the sugar, over a medium heat without boiling, until every grain has disappeared. Stir any stubborn patches with the metal spoon without splashing. Once clear, add a drop of lemon juice. As the sugar to liquefy, whisk it vigorously and continue whisking until it starts to boil. Stop whisking as soon as it starts to boil. Dab a wet pastry brush around the pan so that the water runs into the syrup. Repeat a few times to avoid crystallization. Continue to boil the sugar until it becomes golden. As the sugar caramelizes, gently swirl the pan now and again to ensure even caramelization. To avoid scorching, take the pan from the hob just before the caramel has reached the desired colour, then let the residual heat finish the job. Then quickly whisk in the butter. Carefully add the cream slowly while whisking (take care as it will bubble up). Stir in the salt. Let the mixture cool in the pan for 10 minutes then pour into a glass jar with a lid. When you’ve finished, fill the cooled pan with water and simmer away any stuck-on caramel to make washing up easy. Brownies = child friendly baking and lots of opportunities to lick the spoon. The recipe below makes approximately 16-24 brownies and takes 15 minutes to prep and 20 to bake. I won’t tell you how many calories there are in this desert. Let’s just say, some. 225g (8oz) plain milk chocolate. 250g (8oz) golden caster sugar (or 125g of caster and 125g of muscovado). 100g (4oz) Gluten Free white self-raising flour. 150g unsalted butter, (use a little for greasing the tin). medium free-range eggs, at room temperature. 2 tbsp cocoa powder, plus a little extra for dusting. Place a medium saucepan containing an inch or two of boiling water from the kettle onto the hob and bring to a simmer. Meanwhile, use a little butter to grease the inside of a 9 or 11 inch (depending how deep you like your pudding!) rectangular baking tin then line with non-stick baking paper. Place 175g of the chocolate with the butter into a large mixing bowl that will sit on top of your pan of simmering water, keep the heat low. You can cheat and pop it in the microwave for a minute but don’t over heat or it will take an age to cool. Chop the rest of the chocolate into small chunks and set aside. Whisk the sugar into the eggs with an electric mixer well until the mix is slightly frothy and has increased in volume. Having always used a fork and elbow grease previously I am love with my new coloured VonShef stand mixer from Domu. Perfect if you want a cake mixer, dough mixer, or batter or meringue maker, its dough hook, flat beater and balloon whisk attachments and six-speed settings make this simple to operate and a must have for the kitchen! Domu also offer free delivery and a free two year warranty! Add the cooled (but not solid!) melted chocolate, and gently fold in, before sifting in the flour, salt and cocoa and gently folding again with a metal spoon. Gently pour the batter into the prepared tin, and scatter the remaining chunks of chocolate on top. Bake the brownies for 20-25 minutes. They should still wobble slightly in the middle, as they will continue to cook for a little while when removed from the oven. An over-baked brownie is dry and crumbly, rather than moist and fudgy, so keep an eye on them. Let the brownies cool completely in their tin. Lift them out of the tin onto a board, using the baking paper to help, then cut into squares. Sift over a little icing sugar or cocoa powder. Store in an airtight tin. You have now sorted the two main components of this tasty desert. Now it’s time to get creative. 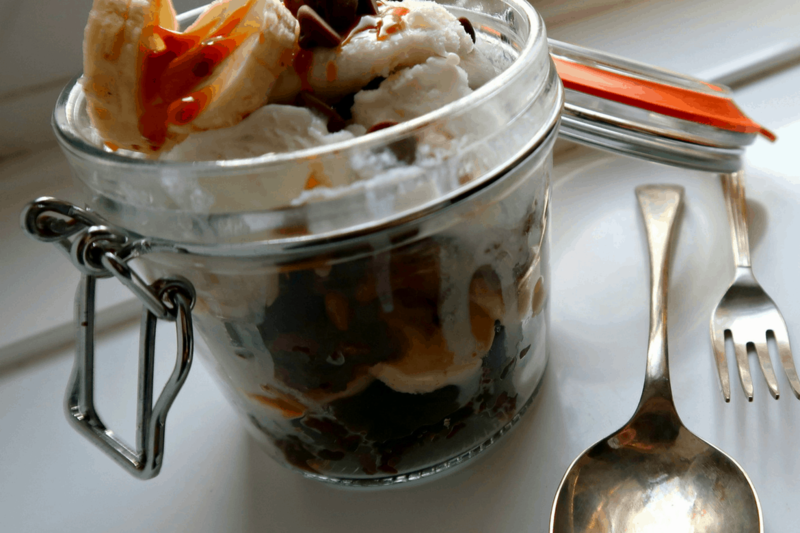 Grab an empty Kilner or jar and place a layer of brownies, chopped banana (or mashed for littler mouths), drizzle with salted caramel and then repeat. To top it off you can add a generous scoop of ice cream of frozen yogurt with chopped pecans or chocolate chips! Are you a brownie fan? What would you add to your brownie stack jar? Do you love salted caramel or hate it? Note: This is a collaborative post, we received the mixer as a gift and all thoughts and feelings on the product are our own.